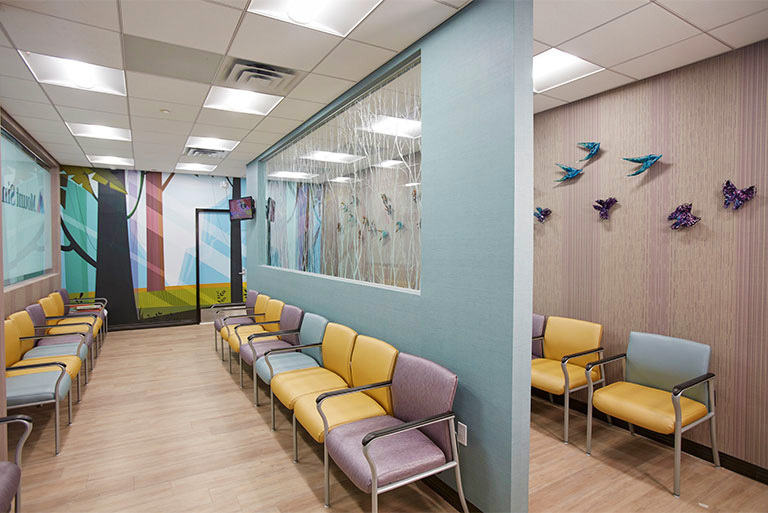 The Pediatrics department at Mount Sinai Doctors Long Island includes six physicians and one certified pediatric nurse practitioner who is also an IBLCE Lactation Consultant. One of our physicians specializes in pediatric gastroenterology. We are committed to providing quality care for infants, children and adolescents. Our practice is open 7 days a week for acute care. In case of illness and depending on the urgency of the problem, an appointment may be obtained with one of the pediatricians who is available that day. All members of the department have access to the electronic medical records and communicate with each other regarding the care of patients within the group. Most parents select one of our pediatricians whom their children see for routine visits. An ongoing relationship is established as the physician becomes familiar with the needs of the child and the family. All patients are seen by appointment only. Newborns are cared for daily by one of the pediatricians in the nursery at Huntington Hospital. When the need arises, newborns are also seen by a neonatologist from the Huntington Hospital affiliated Division of Neonatal Medicine of North Shore University Hospital. We provide lactation support and consultation by appointment. Our goal is to provide care, education, and counseling for mothers and families to help create a positive breastfeeding and bonding experience for mother and baby. Immunizations against infectious diseases are a critical part of preventive care and are required for school entry. We encourage all patients to be fully immunized. For more information on vaccination, visit the Centers for Disease Control and Prevention. Kathrynne F. Yland, MD, completed the CAP PC, Mini Fellowship program in Child and Adolescent Psychiatry for Primary Care. She is skilled at recognizing, assessing, and managing mild to moderate mental health problems in children and adolescents, including attention-deficit/hyperactivity disorder, anxiety, and depression. 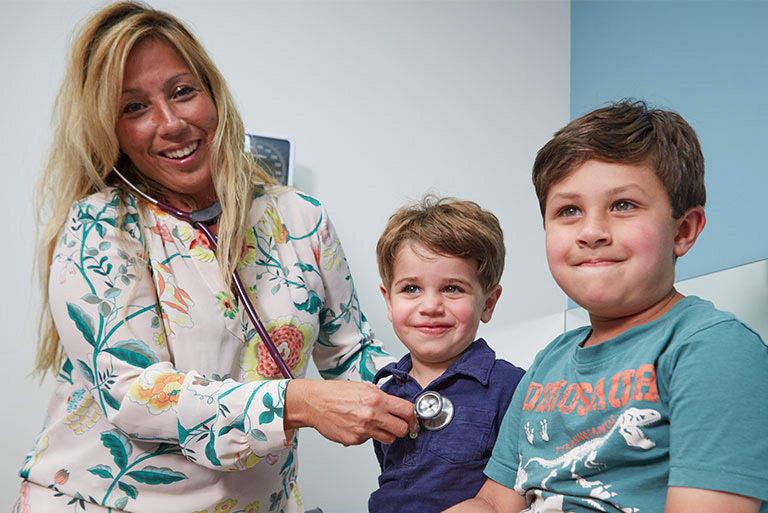 Mount Sinai Doctors Long Island has an onsite lab staffed with skilled professionals trained to work with children. The lab is open Monday through Friday. During the day, our nursing staff is available to provide advice on a variety of common pediatric issues. Nurses also review urgent care and same-day visit requests to ensure patients are seen when appropriate. When possible, doctors will return calls by the end of office hours. After hours, a provider is always on call to meet any urgent medical needs of your child. Pediatricians in our department are deeply committed to sharing information we believe to be helpful and enriching to parents. We utilize guidelines from the American Academy of Pediatrics (AAP) and have literature in many common pediatrics issues like vaccinations, ADHD and frequent ear infections. We have fact sheets from the CDC on all of our vaccinations. We work closely with pediatric-trained radiologists to handle the imaging needs of children on-site. This includes ultrasounds, magnetic resonance enterography, magnetic resonance imaging, CT scans, and x-rays. Patients with complex cases have access to the multidisciplinary team at The Mount Sinai Hospital where we coordinate care with nurse practitioners, social workers, nutritionists, and child-life specialists. Working together, our team is dedicated to achieve the best care for your child.